Once a jumping off point for swimmers, this lighthouse is now 600m from the channel at St Peters Harbour PEI due to coastal accretion. Historical photos courtesy of Carol Livingstone, PEI Lighthouse Society. An ever-fixed mark, the lighthouse at St. Peters Harbour/Havre Saint-Pierre is a visual datum for measuring coastal change and a warning beacon for those developing land and sea in PEI. At the start of the summer NiCHE asked for our favourite and most meaningful photos from summer research or vacation. OK I’ll bite. I’ve seen some amazing landscapes and images so far this year, being lucky (or maybe foolish) enough to have travelled from Vancouver Island, BC to Twillingate Island, Newfoundland, and spent at least a few hours in seven other provinces. But the most meaningful photos to my research have been of the lighthouse at St. Peters Harbour, Prince Edward Island, the earliest in 1917, another in 1965 (both courtesy of Carol Livingstone), and the latest taken by me in July 2013. I’ve never actually come across a lighthouse in my research, but something keeps bringing me back to the north shore of PEI, and to St. Peters Bay where this structure is testament to a changing coastline. My research is mostly about how Atlantic Canadian farmers procured fertilizers and fuels from wildlands, but I’ve also been interested in the use of aerial photographs for studying both land use and landscape change. Alan MacEachern and I discussed St Peters and other North Shore landscapes in Time Flies, a poster at the American Society for Environmental History in Toronto this year, and I recently wrote about mussel-mud digging farmers a little further up St. Peters Bay in Land and Sea. The aerial photographs show that the landscape has changed dramatically since 1935, but it wasn’t until I visited this particular lighthouse — ironically difficult to spot on a vertical air photo — that I realized how extensively this coastline was shaped by the sea. Walking along the shore west of St. Peters Bay, it does not seem obvious that the early twentieth century beach was once over 150 metres landward. But the location of a square tapered lighthouse nestled deep in the sand dunes, and the ruins of a wharf in a shallow barachois pond beyond that provide some clues. Photographs and aerial photos from the last ninety-six years show that the lighthouse was once flanked by flat beaches and the St. Peters harbour fishing wharf (see 1917). Sand was constantly collecting on these shores, banking around the lighthouse by 1965 and filling in the channel to the Bay. The wharf site was abandoned in 1951, but the lighthouse remained an ever-fixed mark, a datum in the rising sand. When I was exploring the site a woman told me that her grandfather once fished from the wharf and her uncles used to jump from the top railing into the nearby channel. Now the wharf is mostly buried and the lighthouse is 600 metres from the channel leading into St. Peters Bay. The accretion of sand around the mouth of the harbour has long been a problem for local residents. For most of the history of this landscape there was of course no lighthouse or wharf at all. When the Mi’Kmaw first appeared on this location the ocean was much lower and further away, and Prince Edward Island itself wasn’t even an island. By 1719, Havre Saint-Pierre was resettled by Acadians, becoming the original and most important Acadian fishing village on what they called Isle Saint Jean. In 1752 French travel writer Thomas Pichon complained about the limited access for large ships and reported a “sand bar that forms at the mouth of the harbour.” The main approach to unwanted accretion is to build large berms in places that would collect the sand before it entered the harbour. These improvements were demanded by PEI officials in 1857 and carried out by Ottawa in the late nineteenth century. But still, engineers could not keep the sand from covering the wharf, entering the channel, and drifting over the lighthouse walls. Thus, St. Peters lighthouse is slowly going the way of Anakin Skywalker’s movie-set home (to which many say good riddance); Anne of Green Gables’ house in Cavendish, PEI, seems safe enough for now. Lighthouses were critical infrastructure in the nineteenth century. To many travellers they were more familiar and important than traffic lights are to us today, but now that we mostly travel by land, and navigate by GPS, lighthouses are at risk of disappearing. The risk is not just financial but also environmental. Most PEI lighthouses only make the news when their sandy perch is threatened by coastal erosion. 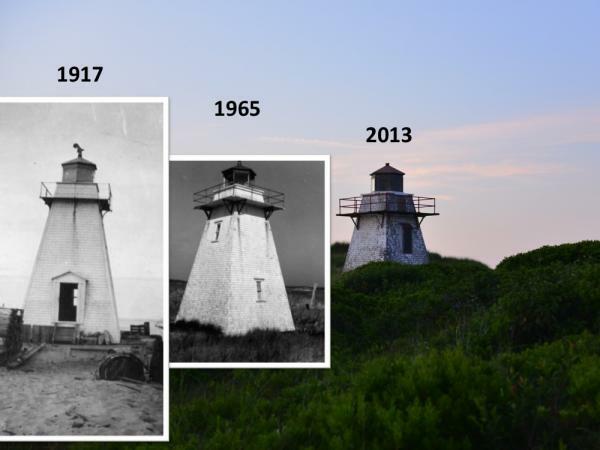 As Federal funding disappears and climate change exacerbates coastal change, the outlook for lighthouses is darker than a night of heavy fog. But some lighthouses actually find themselves further from the ocean every year, and in St. Peters Harbour the lighthouse is a beacon for another kind of landscape change. The more we learn about climate change, fragile coastlines, and our own unpreparedness for flooding (for example in Calgary and Toronto), the more we know we shouldn’t be building our houses on the sand. Coastal erosion has caused a major disturbance to estuarine habitats and human infrastructure in Atlantic Canada since the early twentieth century. Many parts of PEI’s north shore are eroding at rates of over 1 metre per year, and sea level rise and the increased frequency and intensity of storms in the twenty-first century suggest it will get worse. The human response to this information has not been promising. The proliferation of residential, recreational and other infrastructure in the St. Peters Harbour area suggests that people will build as close to sensitive coastal areas as possible. People will also build over heritage areas, perhaps even unwittingly, without a better understanding of human ecology and these historical landscapes. Tracing these shifting landscapes is no simple task. The Greenwich section of the Prince Edward Island National Park is located across the mouth of the St. Peters Harbour, and although it presents an excellent historical and archaeological survey of the inhabitants of St. Peters Bay, it does not identify the location of important nearby sites like the 18th century village of Havre Saint-Pierre, the 19th century harbour improvements, or the twentieth century Provincial mussel mud dredge. 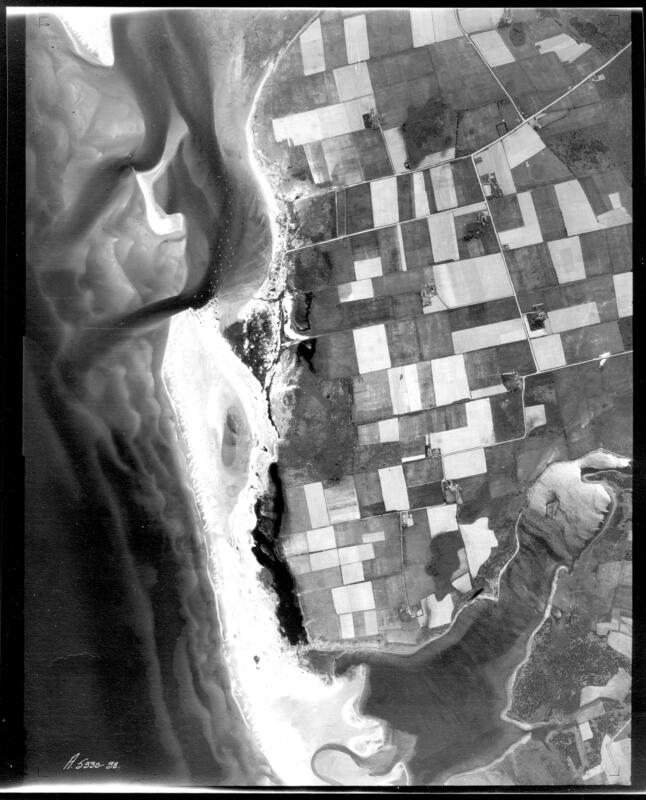 Environmental history, including methods such as the interpretation of aerial photographs and historical maps, can help identify these sites and their significance to local ecosystems. Environmental history is required for more than a commemoration of lighthouses and Mi’Kmaw, Acadian, and Canadian homes and fisheries, but also for an understanding of human ecosystems over time. As Matthew Hatvany has argued, coastal change is highly complex and requires an awareness of both long run history and the ways we think about science. Postscript: I discovered that the title I was planning to use for this piece, “sea change,” was scooped by Lapham’s Quarterly on the same day (The LQ podcast Out at Sea features some exquisite readings by Lewis Lapham). “Washed up” or “Beached” lighthouse didn’t have the same ring to them, so I went with Swallowed by the Seashore. Josh MacFadyen is a Postdoctoral Fellow at the University of Western Ontario and the NiCHE Project Coordinator. Kate MacQuarrie, “A River Ran Through it,” Island Magazine 49 (Spring-Summer 2001): 16-25.